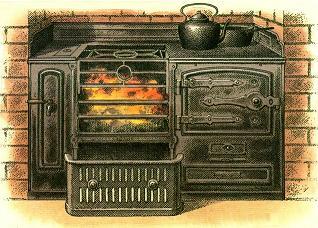 colonial kitchen designs, perfect for the year there's no more utiliies like gas, electricity. WHEN hurricanes hit, or World Wars, when inflation goes crazy and times get tough, sometimes the things we take for granted disappear over night. You can be without electricity, without natural gas, without propane or without a home even. When we are suddenly forced to GO NATURAL... in the KITCHEN... when there is no gas coming in through pipes from the city utility company, no ELECTRICITY ...When your costly porcelain RANGE is deader than the proverbial doornail, who you gonna call? That's easy! 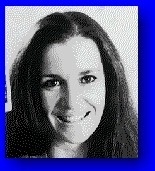 A BRICKLAYER! 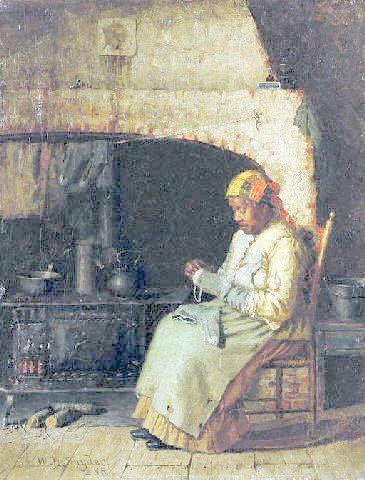 You are going to build a big ole chimney, one so high in the arch that you can lean into it to fetch those cast iron pans that tolerate being set in coals without knocking your head on the proscenium. In the really early days, they didn't have an iron stove to stick in that space, to contain the logs or coal. When people started building fireplaces, the HEARTH was much simpler. An arch so the cook wouldn't bump her head, a floor to cook on. 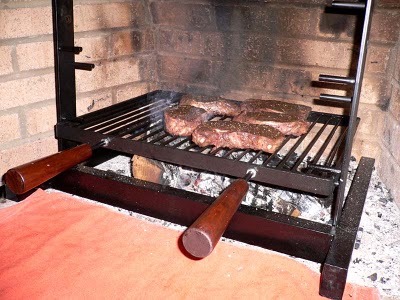 A rack to set on the coals. Probably earthenware pots as cast iron pots didn't exist. At least they don't show up in Medieval museums. That fireplace was used it for cooking. 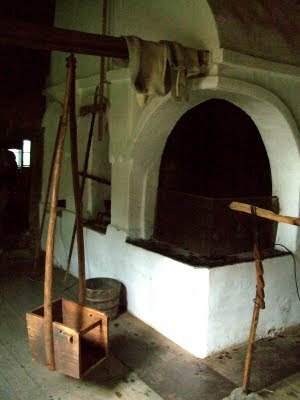 You might add a fire screen so sputtering logs didn't burn holes in the cook's long skirts. on the floor but could sit on a stool. Now, you may think, I have a modern home, I don't want a rustic chimney in my kitchen. But just imagine for a moment that one day electricity goes to 400$ a month or 800$ and you really wish you had a cooking space that used home made coal, (made in a hole in the ground where you cover hardwood burning logs with soil, let it bake for a few days like a luau pig.) That gives you 'charcoal' which is very long burning when used in the chimney. 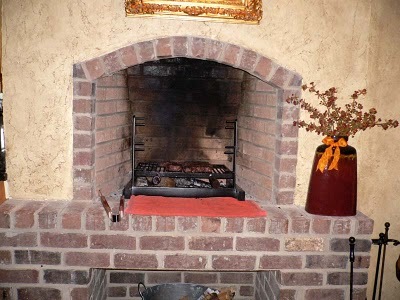 More recently, handy kitchen builders put a metal stove into the chimney hole. I imagine a kitchen in that Welsh house would look like this one above here. It would have a shelf for pots, Probably built of bricks and plastered over. A chopping board of end oak on top, jars for spices, bowls of fruit or veggies. Note the small arched space below for keeping hard wood logs.And the stool because the cook has to sit to move cassaroles inside on the coals. Me, I'd add a rack. 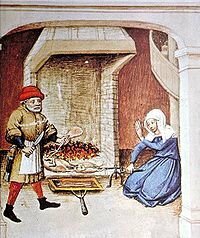 What happened in the l8th century was that they added a cast iron stove to the COOKING SPACE. Don't you just love that? Ovens, now. What a step up! Perhaps you could find a used cast iron stove that wold fit in your chimney. That way you get an OVEN for baking cake, cookies & bread. 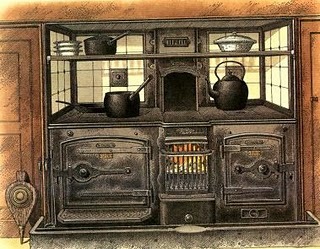 I got the graphics for this iron stove and the one above -- at the website, http://secondriver.blogspot.com/2008_11_01_archive.html so go there to see pictures of COLONIAL HEARTHS. The text is fascinating as it takes us through the last few centuries of kitchen tech. He is a senior and looks like he wouldn't want to bend over much, though on the Show he does. slapping heavy pots into the coals. I'd prefer the raised hearth , myself. Maybe you throw a rack into your chimney. Set your cast iron cooking ware on the rack. If you don't have a rack, you are forced to set things right in the coals. You might use "spider pots". They have legs so you can just place them in among the coals. THE TOP of this one holds coals. 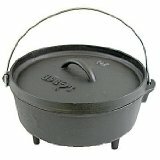 It is called a Dutch Oven. Turn the top over, set on coals and you can do pancakes. So as not to get ashes blowing around on the hotcakes perhaps set it on the grill. If you have a collection of cast iron pots or earthenware cassaroles, but none have legs...then, use an iron grill or rack. See below. The rack sits above the coals Pots go on the rack. If you can't custom build a rack or grill on legs, you will have to find and use spider pots. Garage sales often have cast iron frying pans and pots but I've never seen a spider leg pot except online for sale. Brand new. Here you'll see a close up of a bigger rack and bigger chimney: This could be raised off the floor so the cook can sit in a chair. In a way, our very best modern kitchen design reflects all these different inventions, the niche, the raised oven and burners, the ISLAND, the hanging cupboards as well as the work surfaces and below them, more cupboards. Imagine today's million dollar kitchen suddenly without fuel, without natural gas piped in, without electricity.We know things can happen. Prices can change. Money flow can change. That's why I think when you build your country home, you want to hedge your bets. Be ready for anything. Be ready to go natural. or, if your farm HOUSE IS OLD and you're remodelling, read up on FIXING THE WIRING yourself. PS. If no electricity, how does one wash clothing? There is a device -- a hand-powered agitator used in a sink, tub, or bucket to wash clothing quickly and (supposedly) easily. It could be an alternative for those who lack the space or the funds for a washing machine, or perhaps for those who want to simply wash those things that are supposed to be washed by hand or which may need washing when you have less than a full washer load, or for catastrophes when there is no electricity.